Online Application: Click on the On-line Application. Print the Application Form, complete it by pen, and call Ian at 613-839-1215 or Email Ian for mailing details. 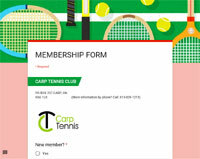 Make payment by Email (eTransfer) to carptennisclub@gmail.com. You will be required to have informed us of the answer to your security question through email carptennisclub@gmail.com or by calling Ian Ramsay at 613-839-1215 (please leave a message). To send or drop off a cheque with your completed application. Please call Ian at 613-839-1215 for mailing details. Membership is not finalized until payment is received. All members will receive an email confirmation. At that time, we will provide all other information such as the gate code. Our membership fees are the most affordable in the area! We want everyone to have an opportunity to play tennis. Click here to download our Membership Application in PDF (Mail or Deliver).